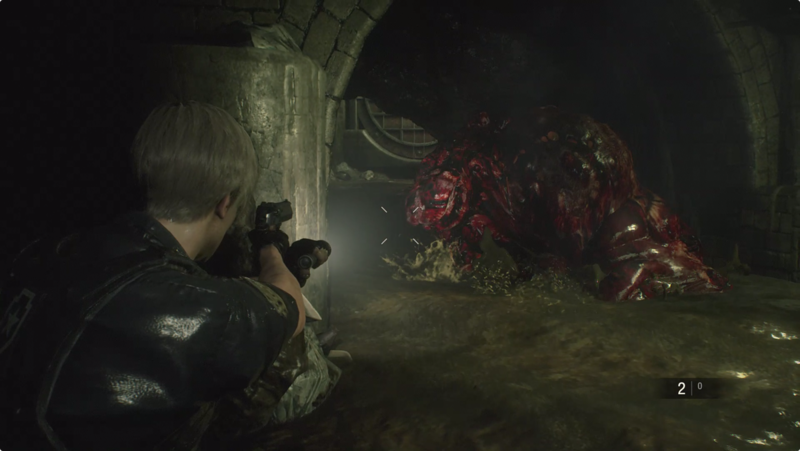 After a brief diversion in the Resident Evil 2 remake, we’re back with Leon in his (your?) [2nd] run. He’s made a remarkable recovery from his gunshot wound because the sewers are a great place for quick healing. Now it’s time to go rescue your new friend. 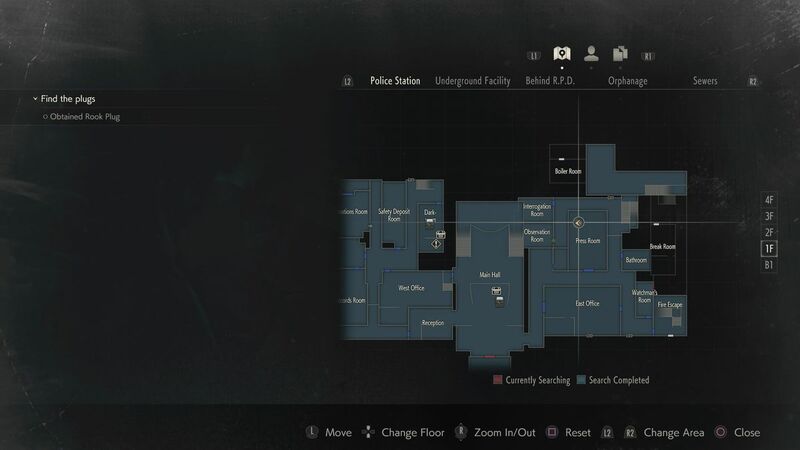 In this guide, we’ll explore the entirety of the Sewers, head back to the Police Station to pick up an upgrade for your Lightning Hawk and some special ammo, pick up the special weapon for that ammo, and fight G (Phase 2) (again). When you regain control of Leon, turn around and take the left at the intersection ahead of you. Take the lift (elevator) up to the second floor. At the top, cross the catwalk to visit the Typewriter and Item Box on the far side of the room. Run down the stairs and drop into the water below. 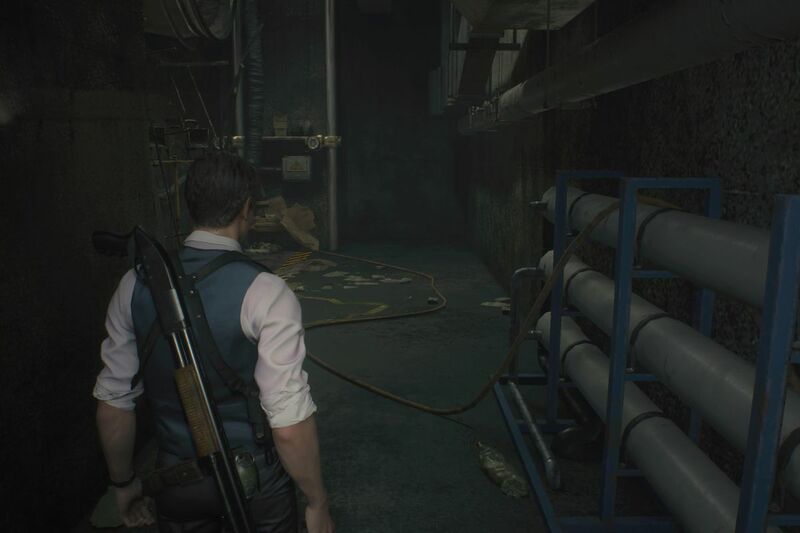 As soon as you land, grab the Large-caliber Handgun Ammo from the trash pile ahead of you, then head deeper into the sewers. Take the right at the intersection and keep following the tunnel until you come to a fork. Follow the left fork first until you come to a fence and grab some Shotgun Shells. Turn around and head back to the other fork and follow to the right (or southeast or just the one on the bottom of the map above) this time. Climb out onto the landing on your right, then head up the stairs. The second corpse you pass will have a USS Digital Video Cassette to grab. 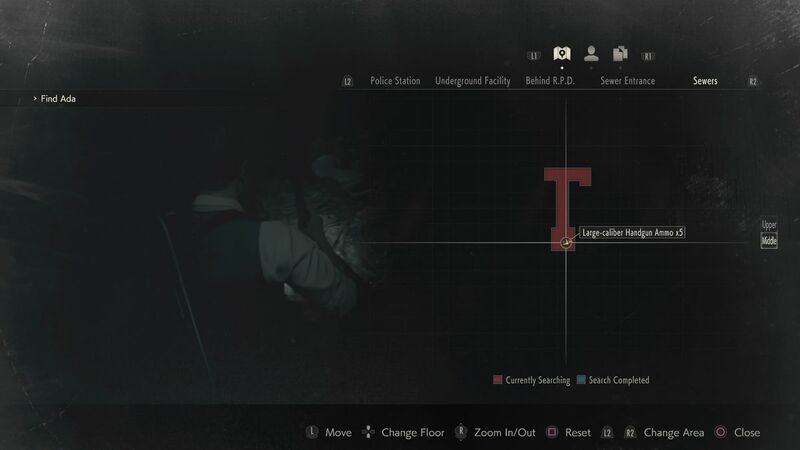 At the top of the stairs, handle the zombie there and continue into the large room. Cross the bridge next to the electrical panel, then follow the walkway to the right and go down the stairs (ignoring the second locked Treatment Facility door). 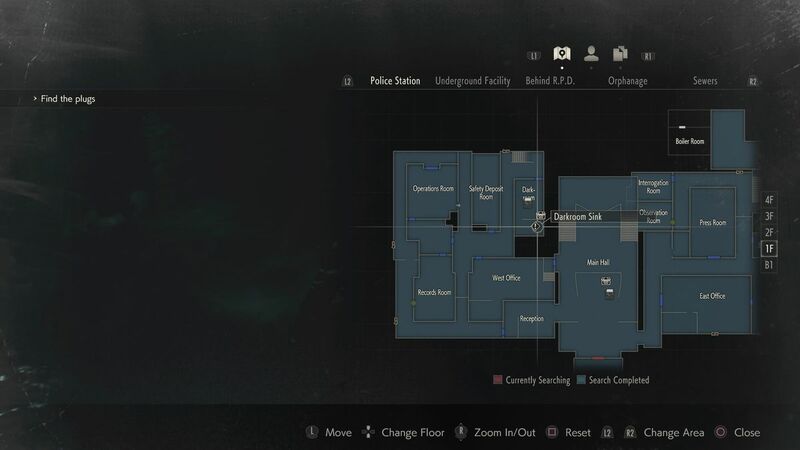 Grab the Combat Knife at the bottom of the stairs, then drop into the Lower Waterway. Head to the west end of the Lower Waterway, then slide down the slope there. Grab the Blue Herb from the landing on your left. Drop back into the waterway and continue to the west. When you come to a fork, turn right and follow that path to its end. Check the ground near the gate for some High-grade Gunpowder, and then turn around and head the way you didn’t seconds ago. You’ll run into your first G-Adult zombie here. You know the basics of this fight — don’t let it grab you, and aim for the giant, yellow eye — but it can be a real drain on your ammo if you’re not careful. After you face your the G-Adult, continue through the muck until you can climb out on your left. Head up the stairs until you get to the Cable Car Platform. Climb the ladder up to the Control Room. 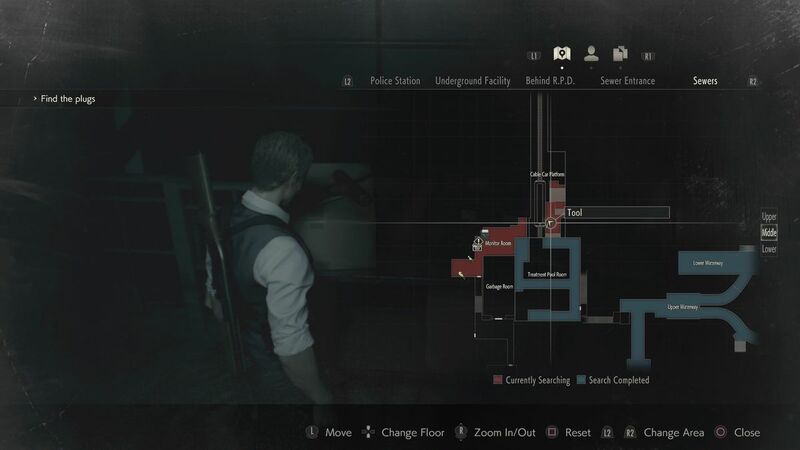 Inside the Control Room, grab the Shotgun Shells and Copy of Emails to Umbrella HQ. The combination to the Dial Lock is the same as it was in your previous campaign, so feel free to enter SZF and collect some MAG Ammo. When you have everything, drop through the hole in the floor to the room below. Editor’s note: At this point, Leon’s overall goal is the same as Claire’s way in the first run campaign. The only significant difference is in the story: You’re going to save Ada instead of Claire. We know you’ve been here before, but it’s still confusing. 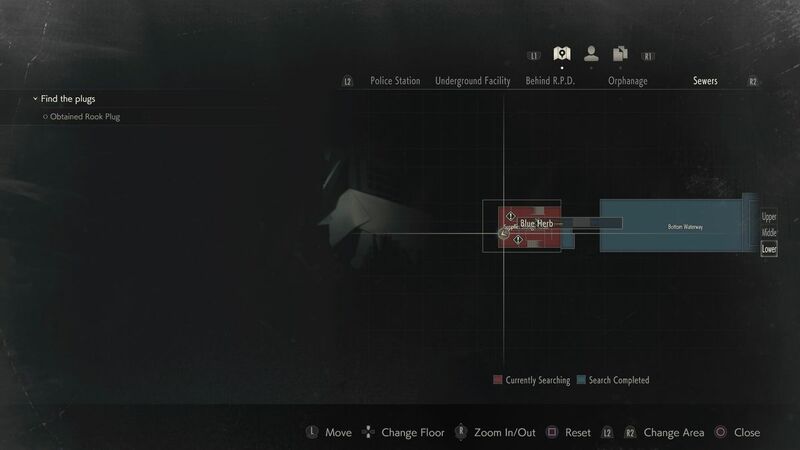 So we’re writing this walkthrough to make your path through the Sewers as fast and efficient as possible. That allows us to skip some things and still escape the sewers with everything there is to collect. Use the VCR to watch the USS Digital Video Cassette, and then use the Typewriter and Item Box. Head down to the southwest corner of the room to find your next big puzzle. Pick up the Unlocking the U-Area Door document on the table and read the note pinned to the board next to it. As before, your goal is to find six chess-themed plugs and place them in the correct panels. You’ve got to get what you’re missing. Exit through the east door into the Treatment Pool Room. Pull the switch to lower the bridge. Cross the bridge. Turn right at the end of the bridge and follow the path. Stop at the safe, and ignore the Blue Herb and the zombie for now. Look at the side of the safe to find its combination: Left 2, Right 12, Left 8. Open it for a Shotgun Stock (W-870). Combine that with the weapon, and you can fire and reload the shotgun in a “one smooth action,” as the description says. Kill the zombie playing dead nearby, and collect the Blue Herb. Double back the other way, pass the bridge, and pick up the Red Herb. Head forward and pick up the Tool. Examine it for its real name: T-Bar Valve Handle. 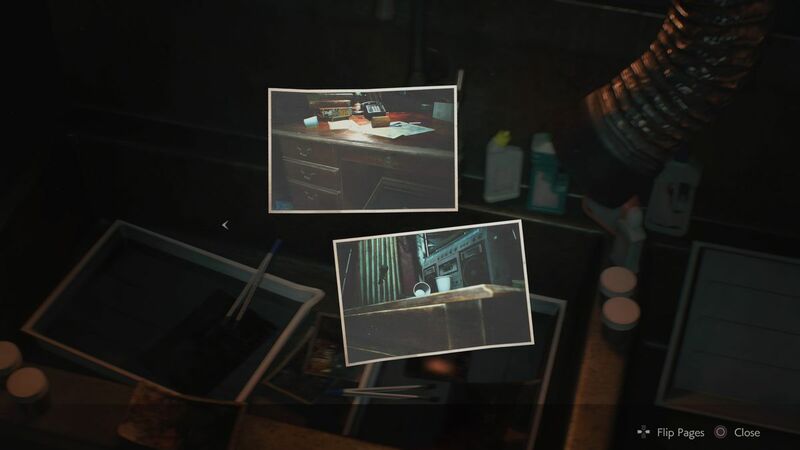 On the same table, you can read Claire’s Note. Back on the southern side of the room, head through the door with the exit sign above it. Head slowly down the stairs while aiming your gun. Kill the two zombies waiting for you below. Collect the Green Herb along the right wall, and walk through the doorway and down the staircase. At the bottom of the stairs, turn left, and take the stairs down. Use the T-Bar Valve Handle to open the door at the bottom of the staircase. Follow the path around, and pick up the Sewers Key hanging on the wall. You can’t get out any other way, so head back out and up the staircase that brought you here. Pull the lever along the right wall to open the gate and create a path to the Lower Waterway. Jump down into the sewage and head left, away from the path you just opened. 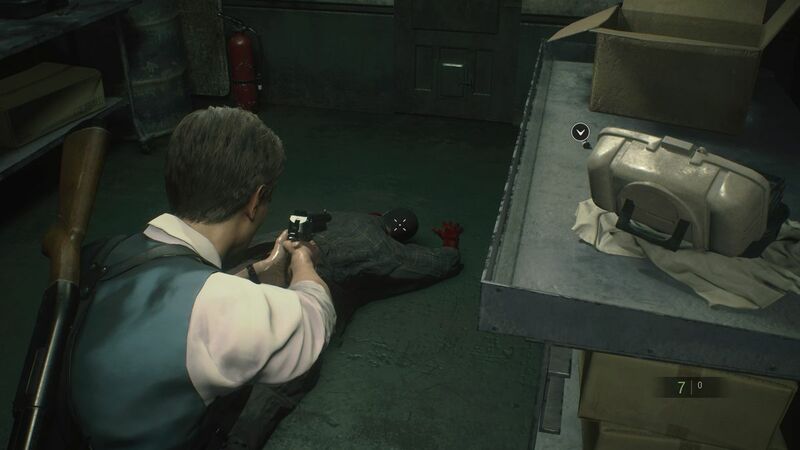 Pick up the Hand Grenade sitting along the left wall. Now head through the path you opened, and hug the right wall. A G-Adult will slither out of a pipe, so watch out. Jump up out of the muck onto the ledge, and insert the T-Bar Valve Handle into the mechanism to open the nearby door. Pick up the Shotgun Shells sitting on a barrel to your left. Take the elevator up. The zombie lying on the floor is just playing dead. Kill it until it is actually dead. Unlock the door and enter the catwalk overlooking the Lower Waterway. Kill the zombie in the hallway. We’re back in the area with two doors labeled “Treatment Facility” in this hallway. Use the Sewers Key on the door to your left — the Workroom. Inside, collect the High-Grade Gunpowder (Yellow) and the Gunpowder (Large) on the table. The Raccoon City Jazz Festival Flyer on the desk in the middle of the room. The letters S, Z and F are circled. This is the combination to the Dial Lock in the Control Room. Interact with the filing cabinet covered in yellow tape to move it and reveal an entrance to an elevator (or lift, if you prefer). Take the lift elevator up, and collect the MAG Ammo sitting on a white paint can in the room. Take the stairs up, and unlock the door. That’ll lead you back to the the Secret Room and the Special Item Box. If you didn’t unlock it earlier, you can use the STARS Badge with the USB key retracted to collect your upgrade. Climb two flights of stairs, and take the elevator back to the Secret Room. Welcome back to the room that took you out of the Police Station. At this point, you can make your way Back to the Darkroom to develop the Roll Film: “Hiding Place” (Key Item) that you picked up earlier. So do that, and use the film in the sink. You’ll get two pictures. 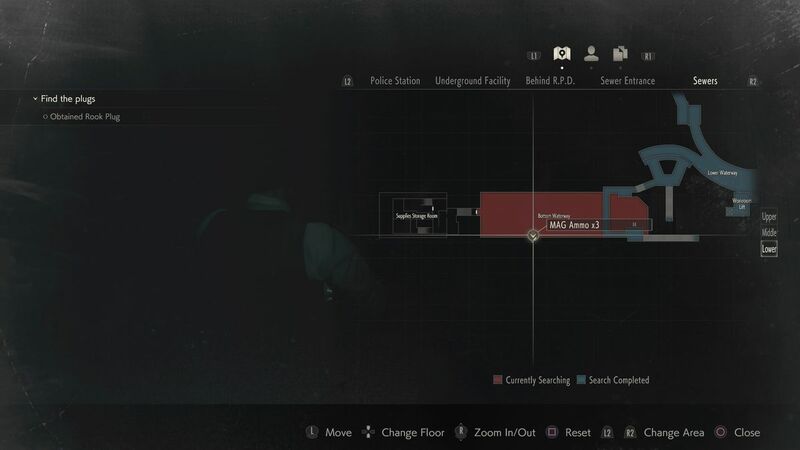 There are two locations to visit to find your items. Make your way back to the Press Room (to the east of the Main Hall). Open the drawer in a table to the let of the podium with the microphones to get Fuel for a weapon you don’t have yet. Go to the office within the office, and open the drawer in the desk. You’ll receive the Red Dot Sight (Lightning Hawk), which does what it says, plus we swear that it seems to make aiming faster. Now make your way back to the Secret Room, into the Sewers and the Workers’ Break Room. Our goal is the Bottom Waterway. When you exit the Workers’ Break Room, turn left and collect the Electronic Part/Rook Plug from the wall. That’ll raise the nearby walkway, but it’s cool. The Bottom Waterway is next, and it’s still filled with G-Adults. So feel free to head back to the Item Box and stock up on ammo. And make sure that you have at least three empty items slots — two will ultimately hold the chess pieces you’re about to pick up. But first, you’ll fill them with herbs and combine them to make a Mixed Herb. Climb up onto dry land, where there are a bunch of zombies napping. You can kill one, but it won’t attack unless you attack it. (We hoped so hard that killing him would prevent the G-Adult from appearing later. It didn’t.) Head back down into more sewage. You’ll fight three more G-Adults here. As always, you’ll need to shoot their eyes to kill them. Sometimes, that’s as easy as shooting their exposed eye. Other times, you’ll have to shoot away layers of (let’s call it) skin covering the eye first. There’s also a friggin’ heavy zombie who appears right next to the third G-Adult, so watch out for that. Take the door at the western end of the room. Head up the stairs, and stop. Turn to your left, and shoot the Mr. Raccoon toy on the ground. Walk through the door into the next room, collecting the Red Herb on the shelf to your right. Walk down a second set of stairs and search the area for a Blue Herb sitting in a cardboard box. You can combine the three herbs you just collected to create a Mixed Herb (G+R+B). In this room, you’ll find Plug Sockets for the Queen Plug and the King Plug. In one, you can collect the Queen Plug. There’s also a Locked Door. Take the Queen Plug from the Plug Socket it’s in (which will close the door). Put the Queen Plug into the other Queen Plug Socket (which will open a door). Deal with the zombies in the area. One or more might spring to life. If you don’t kill them, one can grab you at the end of the next step. Better to just take care of them now. Walk up the stairs, and collect the King Plug from the socket. Jump down into the room below. Put the King Plug into the socket near the staircase, and enter the room to collect the Chemical Flamethrower. Put the Queen Plug in its other socket to create a path to the stairs that get you out of here. Put the King Plug at the base of the first staircase you descended when you got into this room. Exit through the door where you put the King Plug. Now that you’ve got both plugs in your inventory, you can head back to the room with the puzzle, Typewriter and all of that. Hug the left wall and backtrack to the ladder, but beware: There’s a new G-Adult right before the ladder. 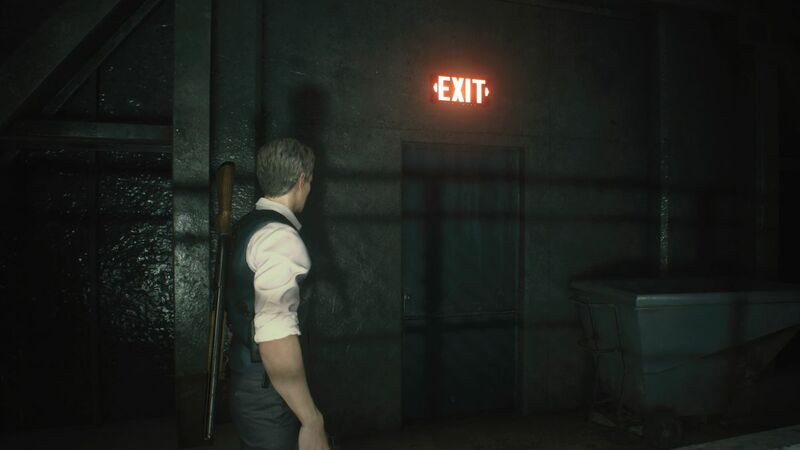 Head back to the Monitor Room (where you scan save and solve the puzzle). OK, we’re back in the Monitor Room. Let’s go ahead and save. After you’re done with that, head through the door you opened when you solved the chess puzzle. Editor’s note: You may have noticed at this point that we use never used the T-Bar Handle to open the door in the Upper Waterway. Turns out if you follow our walkthrough, you don’t need to do that. 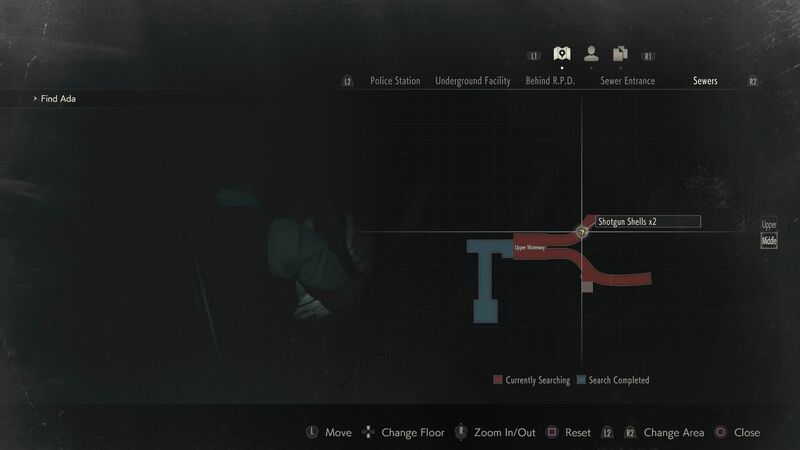 In this playthrough, the Upper Waterway has three zombies in it. Better to just ignore them and that door, which leads to the Sewers Key that we got another way. Head down the stairs and pick up the Blue Herb. The door on your right is locked, so head in the opposite direction and pick up the Green Herb in front of you. Pull the Garbage Collection Room Lever next to the doors labeled WASTE DISPOSAL, and you’ll learn that the power’s out. Head through the other door. Pick up the Red Herb on the ground. You can combine the three herbs you just picked up in the last 45 seconds to create a Mixed Herb (G+R+B). That wouldn’t be the worst idea in the world, since it gives you a health buff and the boss fight coming up is pure, annoying garbo difficult. G will return as G (Stage 2). Run around the room doing your best to avoid his gigantic hand. Editor’s note: If there’s a reliable way to figure out where G’s hand will crash down through the ceiling, we couldn’t figure it out. And we played it enough to be frustrated. If you have a solution, let us know, and we’ll update the guide — and give you credit if you want it. 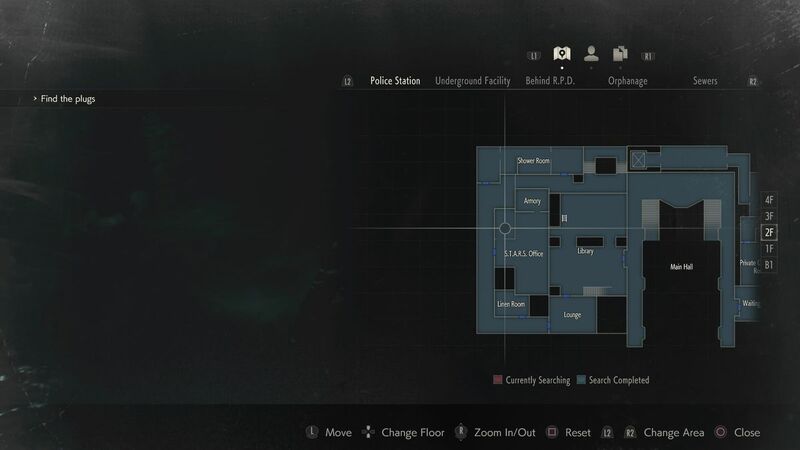 In the area, you’ll find Large-caliber Handgun Ammo, a Combat Knife, a Flash Grenade, and MAG Ammo. Because he’s so powerful, it’s a good idea to eat the Mixed Herb (G+R+B) and give yourself a defensive buff. Interact with the control panel to move the crane off the platform you’re on. 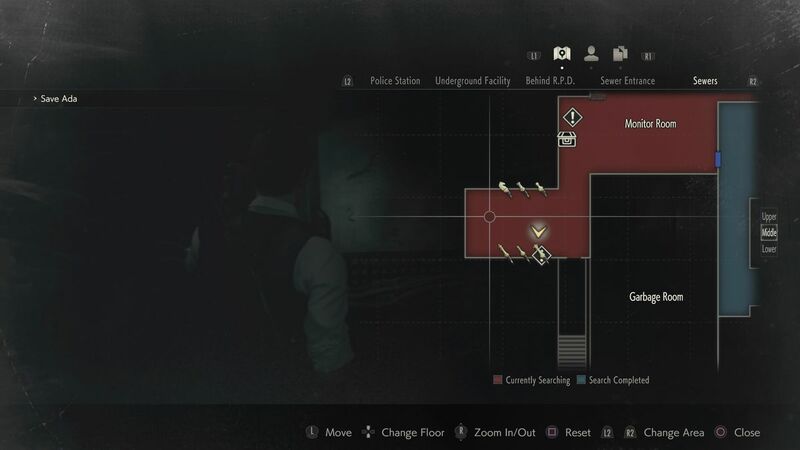 Avoid, shoot, or through a grenade at G (Stage 2) to knock him down at about the middle of the platform you’re on. Interact with the control panel to return the crane. Wait for the crane hit him. It’s simple conceptually. It’s annoying practically. You can use the Flash Grenade to cause G (Stage 2) to stutter. Your Lightning Hawk works well, too. Just make sure don’t knock him down until the crane is docked away from where you’re standing. You want to shoot him, stagger him, and immediately bring the crane back to hit him. Otherwise, you risk him getting up. Do that twice, and you win. Do a loop around the area to collect everything that you haven’t. Take the stairs up, unlock the door and pull the Garbage Collection Room Lever. Or, better yet, head up the stairs first and save. 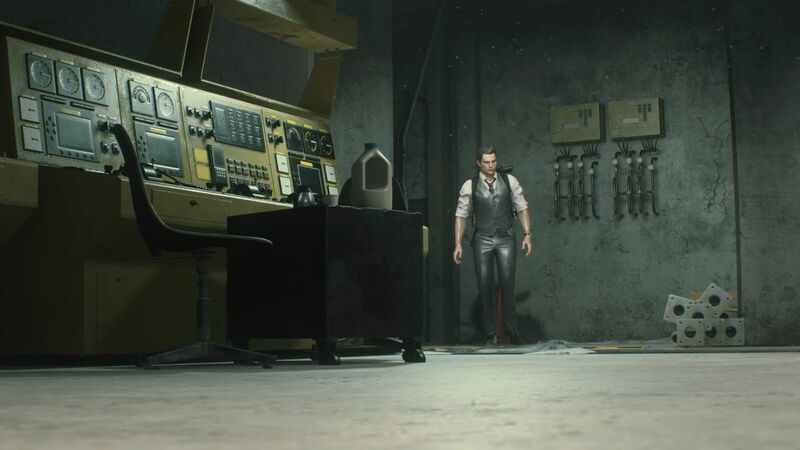 Watch the cutscene to reunite with Ada. Follow Ada to the Cable Car. Pull the lever. Watch the cutscene. Enjoy your ride to the NEST. What’s the difference between Leon and Claire’s campaigns? This Article has a component height of 210. The sidebar size is long.